It is impossible to ignore history in Butte. And Butte's history is largely about working and the struggle for decent wages and dignity and safety in a dangerous workplace. Butte has the second largest National Historic Landmark District in the country. More than 2,200 National Historic Landmark sites have been officially recognized by the U.S. National Park Service. Now, Butte is being recognized for its labor heritage and may receive recognition as a National Labor History Landmark. According to Lysa Wegman-French of the U.S. National Park Service, "Such a designation would provide an additional honor for Butte which is already a National Historic Landmark District. Butte achieved that designation based on its mining past but it may be equally significant for its role in labor history." History though is like the toxic dirt that has covered much of the ground in Butte after a century of mining for gold, silver, and copper. Whether a person recognizes its depths or dangers, or they simply deny its effects until they discover it unexpectedly while digging for something else, it remains an important factor that influences the present and the future as well. In 1878, underground miners at the Alice and Lexington silver mines declined to accept a pay cut from $3.50 to $3 a day for risking their lives underground. They gathered 400 strong behind a brass band and paraded through the silver camp in a show of solidarity. That evening, they gathered at the Orphean Hall to hash out the principles for the new union. They took their constitution nearly word for word from the preamble and bylaws of the unions on the Comstock Lode in Nevada that many had belonged to before arriving in Butte. The Butte Workingmen's Union formed at that 1878 meeting launched an era of union organizing that earned Butte the reputation as the "Gibraltar of Unionism." By 1900, 34 different unions advocated for nearly 18,000 workers in a variety of trades. Unions represented the construction trades, brewers, teamsters, blacksmiths, blacksmiths, and hackmen. Musicians had a Protective Union as did Theatrical Stage Employees and Theatrical Ushers. Other unions represented typographers, waitresses, and bartenders. Even newsboys had their own union and their own strikes. By 1887, only one non-union mine, the Bluebird, remained. On Miner's Union Day, June 13th, a group of union members walked there to "gently intimate to the men in charge that the shutting down of the mine would be in accordance with the eternal fitness of things." Over the objections of the mine superintendent, the workers of the Bluebird were then marched to the union hall and initiated as union members. After what was to become known as the Bluebird Incident, Butte effectively became a closed shop. Unlike Gibraltar, however, Butte's unions were far less durable. By 1914, Butte's union solidarity was fractured by mine owners who employed a rustling card system to identify "troublemakers." A compliant government was quick to call out troops to impose martial law. Private detectives hired by mine owners soon arrived to infiltrate and sabotage unions. The unions also became vulnerable as they fought amongst themselves in power struggles to decide who would represent miners in negotiations. Factions of conservatives, Socialists, and Industrial Workers of the World struggled for legitimacy with union members. Disputes along ethnic lines that pitted Cornish miners against Irish against Finns further weakened the solidarity of the unions and left them easy to manipulate. Concern to protect their ability to work was the main reason that miners formed unions. An underground miner had only his health as capital and he bargained for its value with the owners of the West's early metal mines. Underground mining, especially in Butte, was a dangerous gamble that risked life and limb in exchange for a healthy paycheck. From 1906 to 1925, 685 miners died and hundreds more were disabled, injured, or maimed in accidents in Butte. Of the deadliest mining disasters in the U.S. at the turn of the century, several happened in Butte's mines. Reading the 1949 U.S. Department of Interior report titled "Major Disasters at Metal and Non-Metal Mines and Quarries in the United States," the list sounds like a casualty report from the battlefront of a distant war. On April 21, 1893, 9 miners were killed in a fire in the Silver Bow #2 mine. On May 12, 1905, 7 miners were killed by an explosion in the Cora Mine. On September 3, 1911, 6 miners were killed in a cage accident in the Butte Superior mine. On April 13, 1913, 5 miners were killed in another cage accident, this one in the Leonard mine. On October 19, 1915, 16 miners were killed when dynamite exploded at the surface of the Granite Mountain mine. On February 14, 1916, 21 miners were killed in a fire in the Pennsylvania mine. Smaller, less dramatic accidents claimed about one miner a week and mortuary records are filled with accidental deaths, 65 in 1916 alone. In 1883, 2,000 miners worked in Butte's underground mines. By 1916, there were 14,500 miners working in Butte mines on rotating shifts around the clock. Instead of skilled miners, however, the demand for increased production, "to get the rock in the box," was met with unskilled immigrants often assigned to the most dangerous tasks. Men died or were crippled when they fell down shafts, fell or were jerked from hoist cages, and when they worked under unstable rock that collapsed without warning. These slabs of unstable rock were known as "Duggans" after the most popular local funeral parlor. New workers were handed a tool to pry loose the slabs with the order to go "Bar down them Duggans." Along with the arrival of electricity came better ventilation and lighting. Along with these conveniences, too, came the threat of electrocution. Five miners were electrocuted in 1915 alone. Dynamite explosions took others. Miners used to blasting rock with black powder were maimed or killed until workers adapted to the different properties of nitroglycerin or the dynamite that replaced it. Many more miners were doomed to a slower death caused by respiratory diseases such as tuberculosis, or "miner's con," a consumption that was caused by inhaling quartz dust, the most lethal threat to those who survived the other impediments to health and well being in the mines. In 1914 a study of 1,000 miners found about 400 had a chronic respiratory illness. For soldiers from Butte headed for war in 1917, many may have had a safer workplace ahead of them in France. Their odds for survival may have actually improved by going to war. On the other hand, if the mines and smelters brought death, they also gave life and a decent standard of living to thousands who gambled with their lives and health. The role of the union was to increase the odds of maintaining that health and the decent standard of living despite a trend of falling wages and more dangerous working conditions. While unions bargained for fair compensation, they did much more for their members. They set up funds that insured the care of the sick and the injured, paying to hire doctors or to build hospitals. They paid for funerals for members killed in the mines and comforted their widows and children. They established libraries. They provided sometimes the only building large enough for public entertainment in the early camps, the Union Hall, which usually served as the camp's social center. From these humble seeds grew strong and enduring communities throughout the western mining frontier. Decades before the social safety nets of social security, unemployment insurance, or workmen's compensation, if a miner was injured, he did not work, and, if he did not work, he received no pay. Some owners required their workers to buy food and clothing in company-owned stores or to stay in company-owned boarding houses. With every downturn in the economy, dip in profits, or need for new equipment, the first cost-saving measures usually considered were wage cuts. Some mine owners paid their miners in inflated stock that could quickly prove worthless. Some simply refused to pay their miners knowing that they could call out troops if their workers objected too strenuously. When this happened in 1879 in Philipsburg, Montana, the enraged miners seized the property and worked it until they had extracted enough ore to pay the wages owed to them. In 1893, Butte played a major role in forming the Western Federation of Miners. Delegates from miner's unions throughout the West met in Butte to organize a regional union of miners. The Butte Miner's Union was designated as Local Number One. From the beginning, unions worked closely with mine owners who sparred among themselves for power and prestige and for the allegiance of the miners. In 1899, Standard Oil bought the interests of previous owners and entered the fray with the Amalgamated Copper Company. "The Company," as it was to be known, became omnipotent on the Hill when they crushed their last independent competitor, F. Augustus Heinze in 1903 with a brutal tactic known as The Great Shutdown. The Company found itself frustrated in the local courts by judges who were biased for Heinze. Judge William D. Clancy, for example, was a big bushy bearded, tobacco-chewing magistrate who would nod off on the bench only to wake up and proclaim "The court finds for Mr. Heinze." At that time there was no change of venue law that would allow a new judge if a party to a lawsuit felt that the judge was biased against them. The Amalgamated Copper Company shut down all of its operations in the state putting 20,000 Montanans out of work and then demanded that the state call a special session of the legislature to pass a change of venue law. When the state capitulated, this forced Heinze to sell out and spelled the end of an era of cooperation between mine owners and their workers for their mutual benefit. In a speech delivered on October 26th on the steps of the County Courthouse before 10,000 angry suddenly unemployed miners, Heinze delivered a prophetic eulogy for that era at the same time that he probably delivered his own neck from a noose. He said, "If they crush me today they will crush you tomorrow. They will cut your wages and raise the tariff in the company stores on every bite you eat and every rag you wear. They will force you to dwell in Standard Oil houses while you live and they will bury you in Standard Oil coffins when you die." In March 1912, The Company fired 500 miners who they labeled as Socialists. Then, that December, they imposed a blacklist system to screen workers by requiring miners to fill out cards and answer questions about their union and political affiliations. Those deemed agitators were simply not called for work. Pinkerton and Thiel agency detectives were hired to infiltrate, identify troublemakers, and even provoke violence themselves if possible to weaken the unions from within. Frustration and mistrust had reached a peak in June 1914. Miners were being paid $3.50 a day, the same wage as in 1878, despite the fact that the price of copper had gone from 8 cents a pound in 1878 to 17 to 20 cents a pound by 1914. On the annual celebration of Miner's Union Day, June 13th, an angry crowd ransacked the Miner's Union Hall after their own parade erupted into a riot. When the acting mayor, Alderman Frank Curran appeared in the union hall to plead for calm, he was told to "Go to hell," and then pushed out of the second story window. All semblance of order followed him out the window. The mob removed the union's safe from the building and took it to a field in the valley below. One miner doused the safe with a liquid from a bottle that he swore was filled with nitroglycerin. When it turned out to be whiskey instead, dynamite was used to blow open the safe. Charles Moyer, president of the Western Federation of Miners came to Butte to attempt to mediate the conflict at the next regular meeting of the union on June 23rd. At that meeting, he might have wished he had stayed home. During the contentious meeting, shots were fired, killing one man. Moyer and other union officers vacated the hall and once again dynamite was the tool of choice. The hall was destroyed as the Uptown rocked with the repercussions from blasts throughout the night. Later that summer, The Company took advantage of the dissension to announce that they would no longer recognize the legitimacy of the Western Federation of Miners. The era of the closed shop had ended. On a barren slope of overburden overlooking Butte a platform has been built with a sweeping vista of the Continental Divide. Standing on the platform, the eye takes in a panorama that reveals the progression of mining on the Hill: steel headframes and hoists from underground mining and farther off the terraced remains of what was once one of the largest truck-operated open pit copper mines in the world, the Berkeley Pit. The platform is a memorial to what can't be seen, however, a memorial to what happened beneath the surface. On the night of June 8th, 1917, a group of men descended in the Granite Mountain mine to inspect an electrical cable that had fallen loose while being strung by a crew from an earlier shift. When the assistant foreman accidentally touched his carbide lamp to the frayed paraffin paper that wrapped the cable, it caught fire. The fire and deadly smoke quickly fanned through the stopes and shafts of the well ventilated mine to connecting mines including the Speculator mine. Despite heroic measures to rescue those trapped below ground, 168 miners died. One of Butte's most durable businesses, Miller's Boots and Shoes, was started as a result of the Granite Mountain Disaster. Two brothers, Elmer and Clarence Miller walked out of the mines unscathed. Clarence vowed never to work underground again and started the footwear business that is still operated by his family. Three days after the disaster, a general strike erupted across the Hill with better working conditions and safety the key demands. In 1917, caught up by the strike brought on as a result of the Granite Mountain Fire and the spreading frenzy of world war, a palpable atmosphere of anarchy swept over Butte. Frank Little, an organizer for the Industrial Workers of the World, arrived on July 18th. Little was a veteran organizer who had already helped to galvanize fruit pickers and lumber workers in the Northwest. Now the I.W.W. had set its sights on bringing the copper miners in Butte into the "One Big Union." The radical ideas of the I.W.W., including the belief that workers should take control of the means of production, made mine owners very nervous. The United States had entered the war in Europe in April and the U.S. Army was drafting young men for the fight. That summer a growing anti-draft sentiment was gaining ground in Butte. The draft was unpopular in Butte for a variety of reasons. Irish immigrants loathed the idea of dying to defend the British. German, Serb, Croat, and Italian immigrants were reluctant to return to Europe to possibly kill relatives. Little gave public speeches telling the miners that the war was a conflict that should be left to the capitalists who started it to finish. Workers, he argued, had more in common with each other, regardless of their nationality. These were not tolerant times in Montana and Little had picked the wrong time and place to incite dissent and to encourage what the Company-backed newspapers called acts of sedition. In the middle of the night on August 1st, six men, identifying themselves as officers, abducted Little from his boarding house room. They beat him, dragged him behind a car, and finally hung him from a train trestle on city's edge. No one was ever convicted of his murder. With frustration and factionalism growing, the I.W.W. made inroads until they too were outmaneuvered by the Company in a strike in 1920. That strike was abruptly ended when gunfire erupted at a picket at the Neversweat mine on the Anaconda Road on April 21st. Company security guards opened fire, wounding 15. Two died from their wounds. Even though all but one of those shot were strikers, the Company blamed the I.W.W. for the violence and federal troops arrived the next day to impose martial law and end the strike. On May 12th, The Company banned all members of the I.W.W. from working in their mines. Butte's unions were revived in the 1930s by the growing support of organized labor by the Roosevelt Administration and the policies of the New Deal that struggled to bring America out of the Great Depression. Butte unions were soon strong enough to reestablish the closed shop in a strike that lasted throughout the summer of 1934. The Wagner Act enacted in 1935 legitimized the actions of the unions and their positions were further strengthened by the passage of Taft-Hartley in 1947, which expanded upon the Wagner Act. Longer and more bitter strikes lay ahead in the 1960s and 1970s to hold onto the gains achieved for workers over the decades. Union bargaining continued until 1983, a year after the Berkeley Pit was shut down. Remaining employees were laid off and the huge pumps that kept water from flooding the underground mines were turned off, flooding the mines and the Berkelely Pit. June 13, 1878 -- Butte Workingmen's Union forms during a strike over wage cut from $3.50 to $3 a day at Alice and Lexington silver mines. February, 1882 -- First Miner's Union Hall collapses. March, 1885 -- Butte Miner's Union forms and limits membership to miners only. The second Miner's Union Hall is completed. January 2, 1886 -- Knights of Labor joins with Butte Miners, Tailors, and Typographical unions to form the Silver Bow Trades and Labor Assembly. May 5th to 9th, 1886 - Strike by Utah and Northern railroad brakemen shuts down the Anaconda mine and smelter. June 13th, 1887 -- Bluebird Incident brings closed shop in Butte that will last for 27 years. May 6, 1890 -- strike against wage reduction to $2.50 a day by surface workers prompts strikers to form Butte Laborer's Union. The new union changes its name to Butte Workingmen's Union in honor of Butte's first union. May 15, 1893 -- Western Federation of Miners founded in Butte. Butte Miner's Union designated as Local Number One. July 7th to 23rd, 1894 -- Railroad strike of BA&P and Pullman workers closes Anaconda, Syndicate, and Parrot mines. January 6th, 1896 -- school strike by Butte Teacher's Union. blaming them for bad economic conditions. April 15, 1897 -- Several Chinese businessmen sue to recover $500,000 in damages caused by union boycott. They receive an injunction and win the suit in 1898, and collect court costs, $1,705.05, but no damages. October 22, 1903 -- The Great Shutdown. The Company closes down all operations putting 20,000 out of work until a special session of the legislature is called to ensure a change of venue if a plaintiff believes a trial judge is prejudiced. June 27, 1905 -- Industrial Workers of the World forms at meeting of labor activists in Chicago. One founder, William D. "Big Bill" Haywood, Jr., calls it "Socialism with its working clothes on." September 12th, 1907 to February 29th, 1908 -- Citing a slump in the copper market,The Company reduces its work force by half on September 12th, and then shuts down almost all of the mines on the Hill on December 7th. Full production doesn't resume until the next year. December 1, 1912 -- Rustling card system put in place by The Company. "Agitators" identified by spies are refused cards and therefore work. June 12, 1914 -- Incident at Speculator mine when Muckie McDonald encourages fellow workers to refuse to show their union cards. Evening shift workers at Speculator and Black Rock stay out in support of protesting workers. Walkout stills 1,200 workers and starts week of big trouble. June 13, 1914 -- riot breaks out at Miner's Union Day parade and spreads to union hall. During the riot, the hall is looted and safe is stolen and dynamited. Acting mayor Frank Curran is pushed out of second-story window. June 23, 1914 -- Miner's Union Hall is demolished with dynamite. July 3, 1914 -- Mayor Lewis Duncan is attacked and stabbed in his office. Duncan shoots his attacker in self defense. August 20, 1914 -- Rustling office at Parrot mine is dynamited. September 9, 1914 -- The Company declares an open shop, renouncing the Western Federation of Miners. June 8, 1917 -- Granite Mountain Fire kills 168 men in worst disaster in metal mining history. June 5 to December 28, 1917 -- The Metal Mine Workers Union initially formed to protest the draft for World War I and the rustling card system on June 5th. After the Granite Mountain disaster, the new union forms in earnest and a strike is called on the 11th. Smelter workers return to work and mining resumes on September 16th. By December 28th, the MMWU quits the strike. September 13, 1918 -- A crackdown by local authorities and federal troops prevents a call for a general strike to protest the conviction of I.W.W. leaders. Omar Bradley leads federal troops to shut down The Daily Bulletin and I.W.W. members in Butte and Anaconda are arrested, including William F. Dunne, editor of The Daily Bulletin. February 6 to 17, 1919 -- Strike is called over wage cuts of $1 a day in copper slump after World War I. Governor breaks strike by calling in three companies of the 44th U.S. Infantry. The soldiers bayonet nine strikers on February 10th. April 19 to May 12, 1920 -- I.W.W. calls a strike that leads to "Bloody Wednesday" massacre on Anaconda Road on April 21st. Federal troops arrive on the 22nd, and 500 miners return to work on the 23rd. May 12th, 1920 - The Company bans I.W.W. members from mines. Posted signs read "No member of I.W.W. will be employed at this property." April 1921 to January 1922 -- Citing depressed copper prices, The Company shuts down their mines. 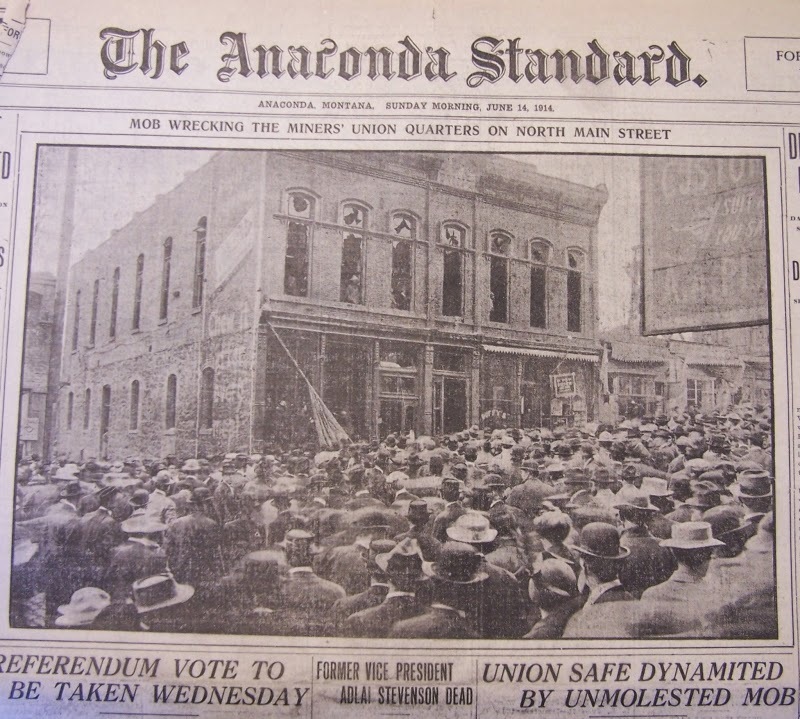 June 20 to July 4, 1927 -- A newspaper strike stops publication of The Butte Miner, Anaconda Standard, and Butte Daily Post. May 8 to September 20, 1934 -- Fourth longest strike results in closed shop again for the first time since 1914. April 9 to 19, 1946 - Short, bitter strike turns ugly when Company has salaried employees cross picket lines to keep mines operating during strike. Mobs roam Butte neighborhoods destroying homes and property of Company "scabs." Carpenter's Union refuses to allow members to repair damages. August 27 to September 6, 1951 -- A national strike is curtailed when a Denver court grants injunction sought by President Harry Truman to force miners and smeltermen to return to work. August 19, 1959 to February 15, 1960 -- second longest strike lasts 181 days. July 15, 1967 to March 30, 1968 -- Longest strike in Butte's history lasts eight and a half months. November 5, 1974 -- Anaconda Company announces the closure of the few remaining underground mines in Butte. July 1 to August 1, 1977 - Month-long strike national strike of non-ferrous metal workers. June 17 to November 21, 1980 -- Third longest strike lasts four and a half months. September 29, 1980 -- Anaconda Smelter closes. April 23, 1982 -- Berkeley Pit shuts down. June 30, 1983 -- Anaconda suspends all operations in Butte. July 16, 1986 -- Open pit mining resumes with 188 non-union workers.